In the opinion of an expert panel brought together by AQUIMER, there is an urgent need to increase awareness of contamination in aquatic products at international, governmental, industry and consumer levels. We also need better evaluation methods for micro-plastics to protect fish and seafood food safety and determine the risks ingestion poses to human health. This topic is important for EuroFIR AISBL, a beneficiary in SEAFOODTOMORROW (http://www.eurofir.org/our-resources/current-projects/seafoodtomorrow, seafoodtomorrow.eu), which aims to validate and optimise innovative and sustainable solutions and improve the safety and dietary value of seafood in Europe, and Sevda Nur Urkan attended to learn more about the issues posed by micro- and nano-plastics in seafood. Ocean microplastics issue and bio-based plastics solution was organised in the framework of “bring EUROPEAN MARITIME DAY to your country”, supported by the European Commission’s Directorate General for Maritime Affairs and Fisheries (DG MARE). 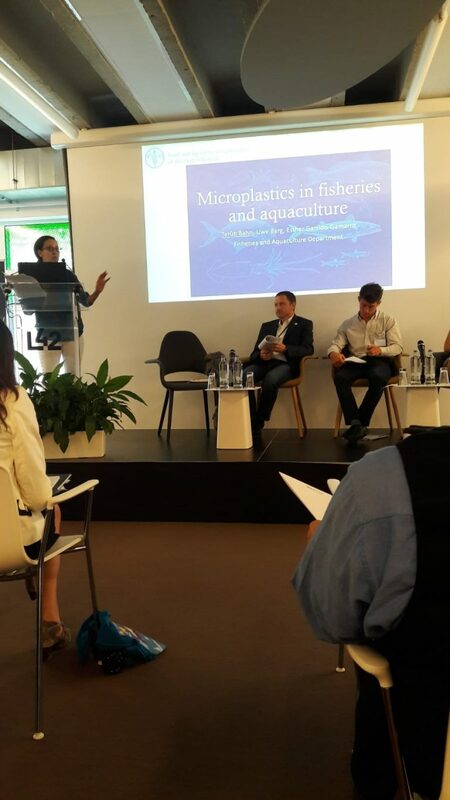 It provided an opportunity for policymakers, civil society, scientific academia, and food industry representatives to discuss the wider issues of plastic contamination in the food chain as well as the role of potential alternatives, such as bio-based plastics, in tackling microplastics pollution.